A boy and his dog set out in search of treasure following a map that marks the spot. 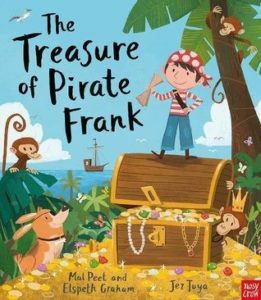 They travel through a forest, a swamp, snowy mountains, and more, until at least they reach the treasure of Pirate Frank, only to encounter a big surprise that was not on the map! The story is told in a way similar to “There Was an Old Woman who Swallowed a Fly” — it has a sing-songy feel to it and as the boy and his dog travel each place on the map, that place gets added to the other places they’ve been as each page ends with “They’re on the map that shows the way to the treasure of Pirate Frank.” The ending is similar to Going on a Bear Hunt as the boy and dog travel back through all the places they’ve been to get away from Pirate Frank. This would be a fun read aloud, especially with it’s surprise ending and colorful, bright illustrations.